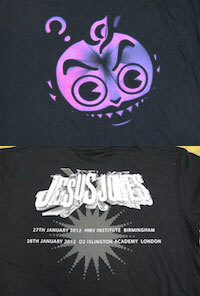 Limited Edition shirt made for the UK gigs in February 2012. Features the return of the “Doubt Devil” on the front, in all-new “3D” design, in vivid purple. Backprint features the updated JJ logo and the gig dates in white and grey.